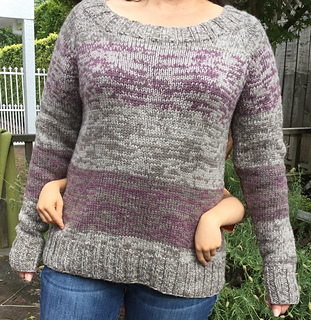 Marled Glow Pullover is a chunky knit sweater with faux cabled details and alternating color blocked stripes of subtle color shifts worked with two strands of yarn alternating three colors for subtle color shifts and intriguing flecked effects. 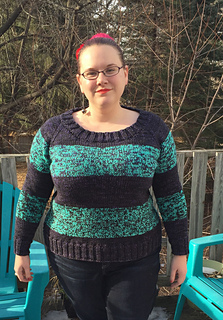 Top down and seamless, and shaped with a loose fit, it’s a sweater that is easy to knit and wear. FINISHED BUST CIRCUMFERENCE—32 (35, 38, 42, 46, 50, 54)” / 80 ( 86.5, 92.5, 98.5, 104.5, 117, 129) cm Shown with 2” positive ease at bust. 16 sts and 22 rows = 4”/ 10cm in stockinette with larger needles AFTER BLOCKING. To insure proper fit, please take time to check gauge. 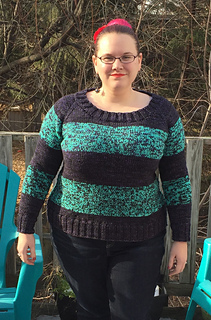 Marled Glow Sweater is knit seamlessly from the top down. The collar stitches are cast on and worked first and then raglan increases are made for the shoulders and simultaneously short row shaping drops and curves the neckline. 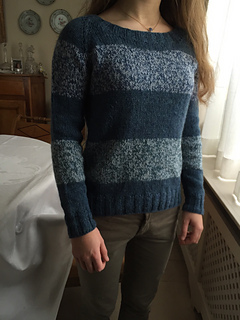 The sweater is knit in the round down to the hem. Sleeve stitches are held on waste yarn and slipped to a needle after the body is completed, and knit top-down and in the round. To create the flattering silhouette, this design includes waist and hip shaping along princess lines designed to follow the wearer’s curves. There is gentle waist shaping and more hip-shaping for a slightly A-line silhouette that drapes and flows over the figure without clinging to the waist or hips. Please spend some time looking over the schematic to help you choose your size and decide on any modifications to the waist or hip shaping. Some positive ease is recommended.